Bruce Westcott became General Manager of the CVSWMD in June 2016, as part of a career that has included financial management, consulting, and the management and implementation of complex information systems. He’s always wanted to work with public-sector enterprises in implementing efficient operations and effective information management strategies. He’s excited about learning the dirty details of solid waste management from all of the District’s motivated staff, Board, and stakeholders, and looks forward to finding ways to help our staff to provide high-quality, cost-effective services to the District’s member towns. Running, hiking, snowshoeing, canoeing, and gardening crowd the edges of his work schedule. Barb has been with the District since the turn of the century (this one) and loves chatting with residents about their solid waste and the CVSWMD’s programming – no, really – so give her a call with questions or comments. She has a BA in writing, likes to cook, read and make music. Annette has been with the district since October 2008 as the bookkeeper. She was previously employed for 25 years with the Department of Environmental Conservation followed by 5 years with the Department of Education in the Accounting Section. Annette enjoys all crafts, reading and having her grandsons around. 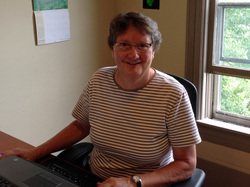 Cathleen joined CVSWMD in March 2014 as the District planning analyst. Her commitment to recycling began over four decades ago as a volunteer in a local recycling center and later as a member of a town committee which started and ran a recycling center from 1988 to 1993, when the center became a regional district drop-off site. Graduating with a bachelors degree from the University of Michigan, Cathleen taught special education in the Northeast Kingdom in the mid-1970s. She then got her master’s degree in Geography at the University of Vermont and has held a variety of research and planning jobs in Vermont, most recently as a municipal planner. Cathleen loves to garden, bake, ski, and travel and enjoys watching U-Michigan and UVM sports. Cassandra joined the district in July 2012, as it's first Zero Waste Outreach Coordinator. She has since built the program to include a wide array of composting and recycling education and built an increasing awareness of zero waste concepts in the region. She earned a Master's Degree in communications from Boston University in 1994 after graduating from Smith College with a BA in English Literature. She spent many years as a journalist and free-lance writer while homesteading in rural Vermont. She brings a passion for gardening, composting, and the natural world to the district, with a particular interest in CVSWMD's Zero Waste philosophy. Charlotte began working at CVSWMD in November of 2014. A UVM graduate, with a B.S. in Environmental Science, she is passionate about environmental and social justice. Charlotte has had a few roles at CVSWMD, starting as Program Coordinator, shifting focus to Outreach Coordinator and most recently becoming Operations Manager. She is excited to be working toward a vision of zero waste within her community as an important step toward responsible resource use and conservation. In her free time she can usually be found outside. 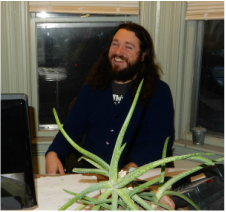 Theron joined the CVSWMD team in September 2018 for an ECO AmeriCorps service year. He studied international relations, focusing on environmental and energy policy and graduated from Tufts University in Boston in 2015. He is concerned about global climate trends as influenced by our society and hopes to work to make Vermont a leader in efficiency and sustainability. He is an avid outdoorsman, craftsman, musician, and cook. Jan joined CVSWMD staff in 2017 as Zero Waste Events Coordinator. Their undergraduate studies focused on culture, sociology, and archaeology. Responsible Business and Sustainability became the focus during Jan's Master’s studies at Goddard. Jan has started, owned and operated Red Thread (clothing design, alterations and education), and Rock, Paper, Scissors (sharpening knives and tools). They have a passion for reuse and repurpose education and also spend as much time in the garden and forest as possible. Carl came to Vermont in 1991 and fell in love with Vermont's landscape and communities almost overnight. Carl holds an A.A. in Forestry from Sterling College in Craftsbury, a B.S. in Natural Resources Planning and a M.Ed. in Secondary Education, both earned at UVM. From surveying fisheries and planting trees to teaching seventh grade science, Carl has always been passionate about how Vermonters can live sustainably. Carl notes that there is no 'waste' in natural systems; and his work is driven by the belief that Vermonters can live lighter on the land by using less stuff and using the stuff we need more efficiently and artfully. Mike is a normal person who likes your garbage. He used to work at the CVSWMD depots, ten years ago, and he’s been back since 2015, looking to recycle more stuff. He would love it for you to come by the ARCC while he is working. Brenna joined CVSWMD in September 2016. Following her passion to understand and conserve the natural world, she graduated from Roger Williams University with a B.S. in Environmental Science and Chemistry. She bounced around the country as a park ranger and a field naturalist from Oregon to New York State before settling in Vermont. She is excited to pass on the zero waste mentality into the next generation of Vermonters. In her free time, you will find her backpacking, jumping in lakes, identifying plants, and hanging out with her dog, Dune, and cats, Timber and Hyphae. John joined the District in September 2016. He holds a B.S. in Biology and Environmental Studies from East Stroudsburg University. His background in the environmental realm includes work in wildlife conservation, water resource protection, and environmental education. Combining his environmental program experience with five years’ experience working in public schools, John is excited to be working with the District’s schools on their zero waste programming. Documenting Vermont’s herptofauna, hiking, canoeing, and gardening are some of his weekend pursuits. Bob Freeman is our longest standing staff member, having worked here since 1998. Bob helps keep all field operations running smoothly. Among his many responsibilities are driving for the Compost Program, making tote deliveries and ensuring all compost customers have the equipment they need, and staffing all CVSWMD collection events for electronics, hazardous waste, etc. Bob is a native Vermonter and a huge Yankees fan. Tom joined the CVSWMD in 2016. He loves working outside and having a positive impact on his community and the environment through his job. Tom also works as an equine dentist. He enjoys being outside in his free time and spending time with friends and family.